ST. GEORGE — One of the final building projects Dixie State University President Dr. Stephen D. Nadauld will oversee before retiring after this academic year, University Tower, will be dedicated as part of D-Week festivities. The dedication ceremony will be held at 7:30 p.m. on Apr. 10 in the center of the DSU campus at 225 S. 700 E. in St. George, on the DSU Encampment Mall near the Jeffrey R. Holland Centennial Commons. The ceremony will feature entertainment, including a performance by the DSU Jazz Ensemble, fireworks and a light show choreographed to music emitted from the tower. There is no charge to attend and the public is welcome. Light refreshments will be served. Located on the south end of the DSU Encampment Mall, the 85-foot tower features lighted clock faces on three sides of the structure and carillon bells that are programmed to play music, including the national anthem, at the beginning and conclusion of each school day. The tower includes five layers of LED lighting, with each layer featuring 16 million different colors. Visible through the tower’s two glass sides, a variety of colors will be displayed when the light-emitting diodes are programmed to do so. However, on most occasions, the tower will glow with a white light, symbolizing a beacon of learning. The tower also emits a beam of light, which can be cast in a variety of directions and diffused by lenses so it is not distracting to community members. “The colors are very brilliant, not dull. That’s the thing about LEDs, they’re really bright and exciting,” Sherry Ruesch, executive director of campus services, said. The tower, which was funded by a charitable remainder trust, was part of the original Centennial Commons design, but construction was postponed until February. Jacobsen Construction built both phases of the commons. As part of the festivities surrounding the tower dedication, DSU is holding an essay contest. Community members are invited to pick a quotation that has helped shape their perspectives, lifelong learning processes and goodwill toward others and write a paper on how that wisdom has enlightened them. The contest is free to enter, and essays are due April 4. Entries should be a maximum of 700 words, not including an introductory paragraph that incorporates the selected quotation and basic background information on the quote’s author. Additionally, a cover page with the date, essay’s title and entrant’s name, relation to DSU, phone number and email address must be submitted with the essay. For more information and submission information, call 435-652-7826 or email acomeford@dixie.edu. All essay writers will receive a prize, and the best-essay winner will receive an engraved tower paver. Winners will be recognized at the University Tower dedication. 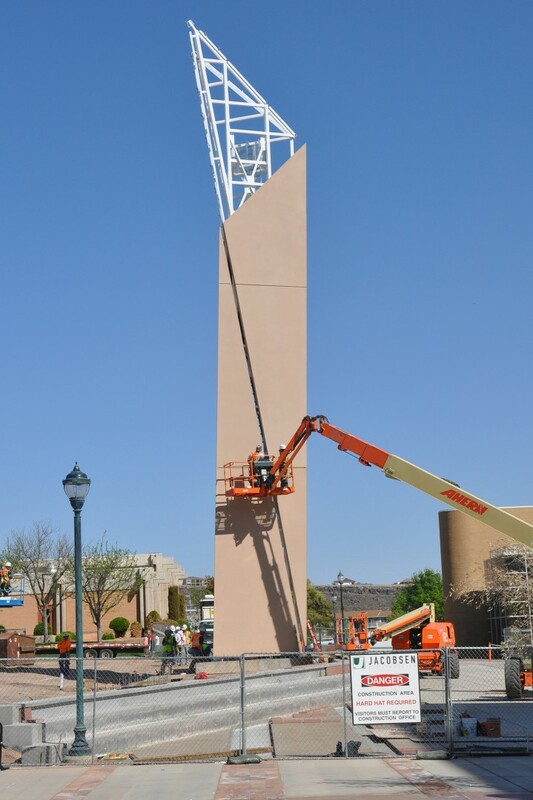 Serving as a beacon of learning, the tower will be surrounded by legacy pavers, which are bricks inscribed with words of wisdom left by alumni, residents and friends of Dixie State. The community is invited to choose their favorite quote and have it put on a paver for $600. For more information, call the DSU Development Office at 435-652-7509 or visit www.dixie.edu/pavers. When: Thursday, April 10, 7:30 p.m.
thanks for the pointless light pollution there “Dixie”.